U.S. crude rose 30 percent in the first three months of the year. Oil prices draw support in 2019 from efforts by OPEC and allies like Russia to withhold around 1.2 million barrels per of supply. U.S. sanctions on oil exporters Iran and Venezuela also underpin the surge in the cost of crude. Nick Oxford | Reuters A worker walks through an oil production facility owned by Parsley Energy in the Permian Basin near Midland, Texas, August 23, 2018. 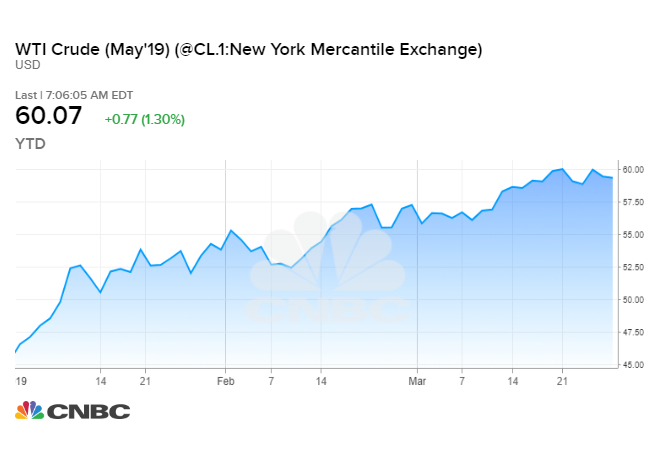 CNBC –Oil prices rose on Friday, on track for their biggest quarterly rise in a decade, as U.S. sanctions against Iran and Venezuela, as well as OPEC-led supply cuts, overshadowed concerns over a slowing global economy. The May Brent crude futures contract, which expires Friday, gained 57 cents to $68.39 a barrel, gaining 27 percent in the first quarter. The more-active June contract was up 57 cents to $67.67 a barrel around 2:30 p.m. EDT (1830 GMT). “It seems that the Trump administration may be more serious about imposing sanctions on Iranian oil this time around,” said John Kilduff, a partner at Again Capital in New York. Also lifting prices this year has been a deal between OPEC and allies such as Russia to cut output by around 1.2 million barrels per day, which officially started in January. OPEC’s de facto leader Saudi Arabia is struggling to convince Russia to stay much longer in the pact, and Moscow may agree only to a three-month extension, three sources familiar with the matter said. In its latest monthly report on Friday, the government said U.S. crude production edged lower in January to 11.87 million bpd. U.S. energy firms this week reduced the number of oil rigs operating to their lowest in nearly a year, cutting the most rigs in a quarter in three years, General Electric Co’s GE.N Baker Hughes energy services firm said. Futures gains have been capped this quarter by concerns about a slowing global economy that could hit crude demand.